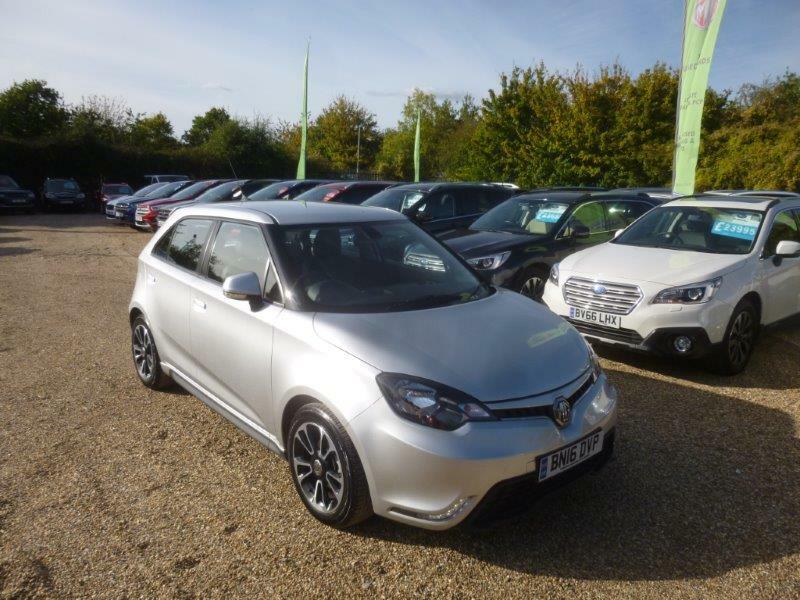 Here at Perkins MG Essex we have one of the largest selections of New and Used MG 3 models in stock with great Nearly New savings available. 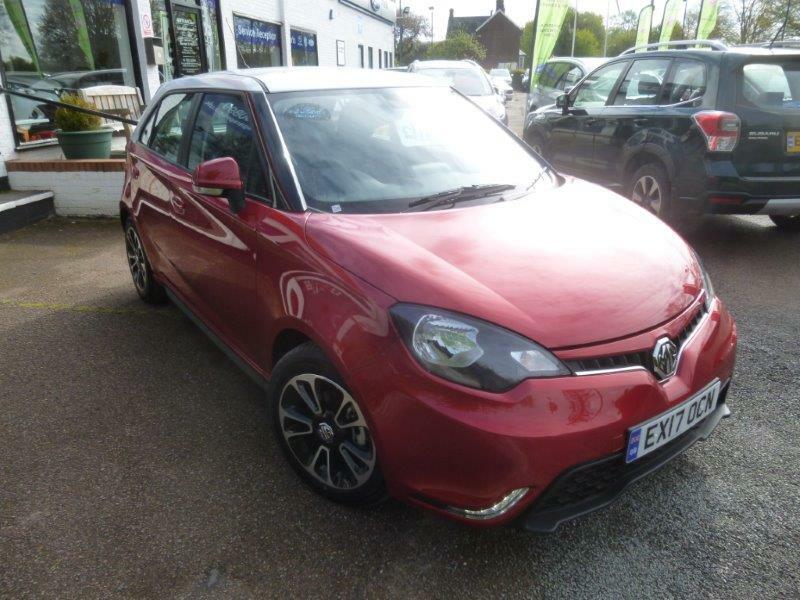 We partner these Form Sport and Style Lux models with an excellent 6.9 & APR Finance deal to make an MG Motor available to you with Zero Deposit and prices from just £149 / month. 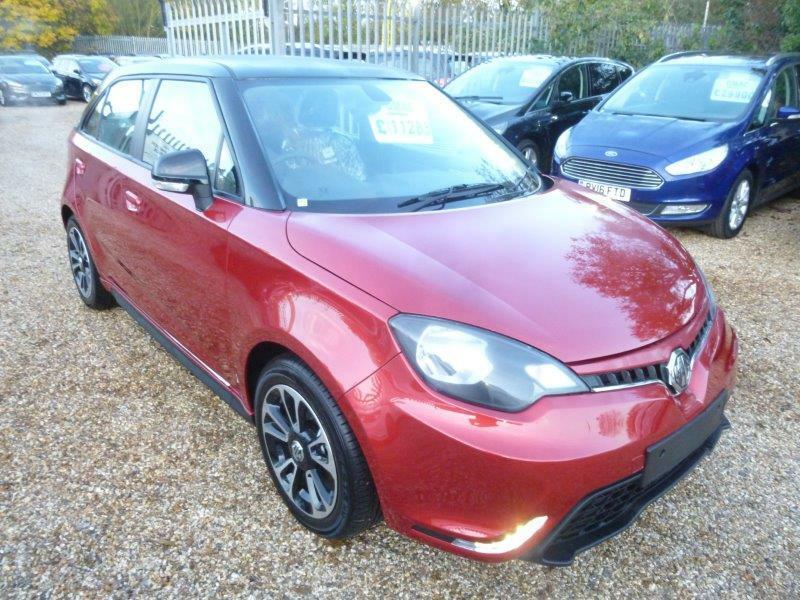 All of our 15 used MG 3 in stock are under 10000 miles and 1 Owner vehicles with Full Service hIstoty and the balance of the manufacturer warranty remaining. We are Open 7 Days for convenience so please call 01376 550899 to book your test drive appointment if you are now ready to buy. 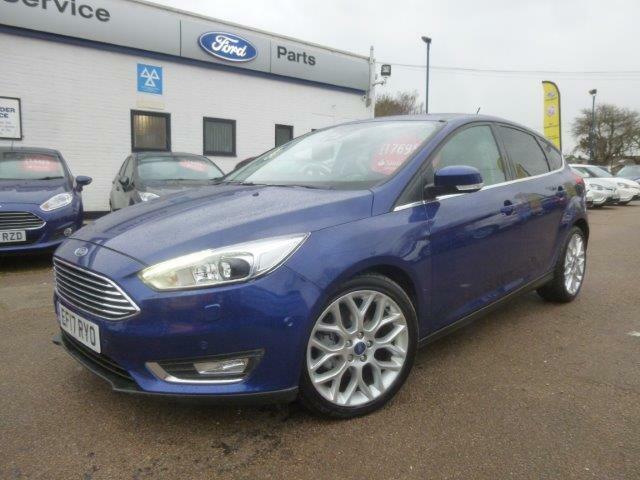 Perkins Nearly New Ford Centre has re-stocked for the busy period and now have 10 used Ford Focus Automatic Powershift high specification cars in stock for you to choose from. 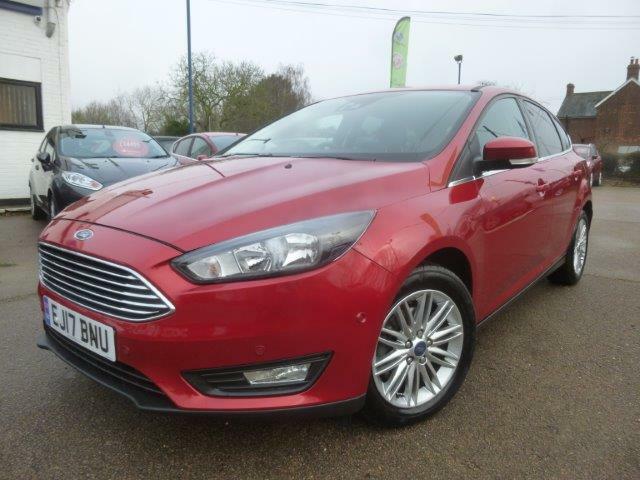 We concentrate on stocking low mileage vehicles with 24 months plus remaining on the Ford warranty to give you as much peace of mind as possible. Every motor car goes through the Ford inspection and service preparation program to ensure you are in safe hands when it comes to your next Nearly New Ford. You can even extend your Ford warranty up to another 3 years on top if this is under consideration with no mileage restrictions. So what do we have to choose from ? Lets talk about engine choices first. ECOBoost - The story of less fuel - With its turbochrager, direct injection and diamond like coating on the piston rings, the Ford EcoBoost engine repoduces the same performance as a larger engine, but with superior fuel economy and lower emissions. The new Ford Focus gives you a choice of three EcoBoost engine sizes and its the three that are mated to the Automatic Powershift gearbox that matter here. 1.0i EcoBoost - Three times winner of international Engine of the year and the 1.5i EcoBoost - All the power and performance of the 1.6 litre EcoBoost it replaces, but with even fewer emissions and better fuel economy. Lets look at some fuel economy figures too - For the 1.0i 125 ps engine the 6 speed Automatic has 170 Nm of torque / 125g/Km Co2 Rating and on the combined cycle published and Government tested figures are 51.4 mpg - In our experience in real world driving conditions with electrics, Air Con being used its closer to 45 mpg. For the 1.5i EcoBoost 150ps engine the 6 speed Automatic has 240 Nm of torque / 140g/ Km Co2 Rating and on the combined cycle (as above) - 46.3 mpg - Real world closer to 40mpg. Lets now talk about the Diesel TDCi Ford technology available in the Ford Focus Automatic Powershift. Much media speculation has affected diesel purchases and in reality, there is no problem in going for another or new to you diesel engine car. The emissions are all Euro 6 compliant and the fuel economy, along with the performance and noise and power delivery is impossible to ignore. Cheap Road tax is also a bonus and if you are trvelling over 15000 miles per annum, a TDCi from Ford is the right engine choice. 1.5 TDCi Duratorq 120 ps Stage VI+DPF offers 300 Nm of Torque a Co2 Rating of 109g/KM and a combined cycle of 67.3 mpg. The 150ps offers 370 Nm of Torque and a Co2 Rating of 115 g/ Km and a combined cycle of 64.2 mpg. 2 rather fabulous new editions to Perkins stock this week - Both are 2017 cars with less then 5000 miles and both are tough cars to find in the current Nearly New market. 1. 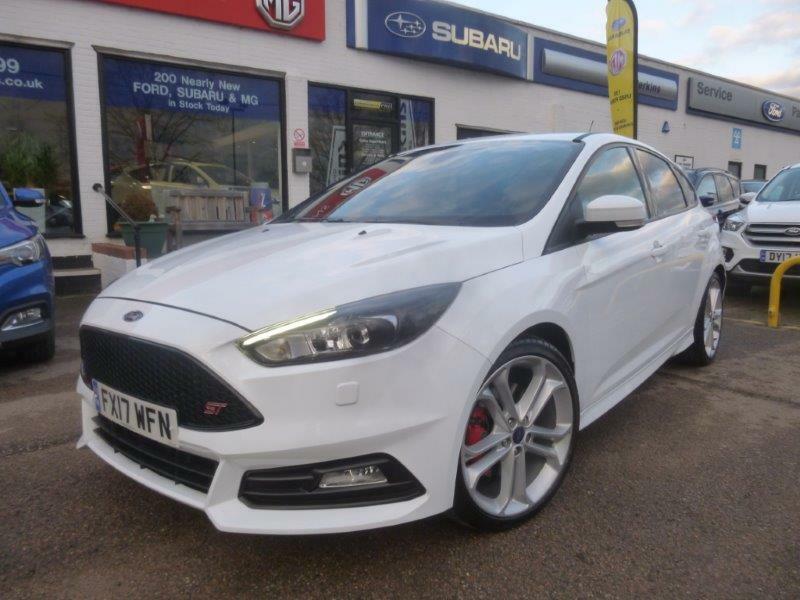 FX17WFN - 3000 miles in Frozen White - Focus ST-3 250 ps ECOboost 5dr with SYNC 3 Satellite Navigation / Appearance Pack / Accoustic Glass and Reverse Parking sensors - Dual Zone Climate Control with Cruise Control - Power heated / Folding Door Mirrors - Auto Lights and Wipers and Full Leather RECARO Trim, all feature on this super hot Hatch from Ford and at just £21995 it's teriffic value for money too. 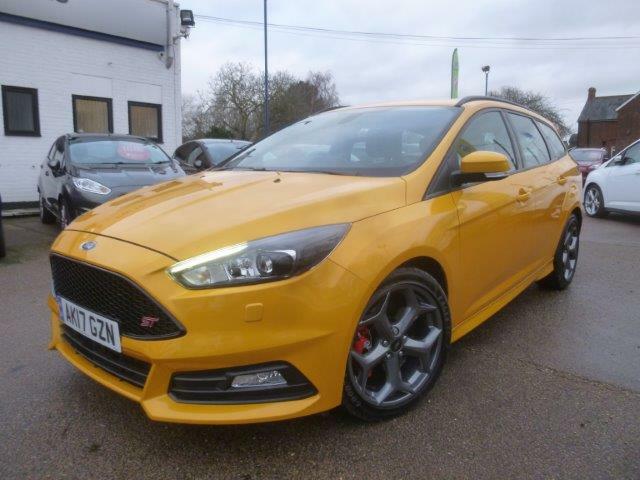 2.AK17GZN - 4000 miles in Tangerine Scream - Focus ST-3 185ps TDCi Estate Powershift Automatic Paddleshift - SYNC 3 Satellite Navigation / Appearance Pack / Keyless Entry / Acitve Park / Driver Assist / Dual Zone Climate Control with Cruise Control - Power / heated /Folding Door Mirrors - Auto Liughts and Wipers and Full Leather RECARO Trim, all feature on this very rare hot Estate family car - the performance with the gearbox is something pretty special and at just £21995 is again superb value for money. Take the time to visit Perkins Nearly New Ford centre if you are ready to buy. You can meet the friendly and knowledgable sales team who are happy to help with part exchange prices and finance quotations adn any other help oir advice you may need - We are open 7 Days - You can call us on 01376 550899. Welcome to Perkins Subaru Essex - We are proud to annouce the New Subaru XV to our dealership - We have demonstrators for you to drive and experience and we are open 7 days for conveneince - Prices start at £24995 - PCP Launch Offer of £1999 Customer Deposit - £1500 Contribution from SUBARU UK - £365/ month over 48 - 4.9% APR . 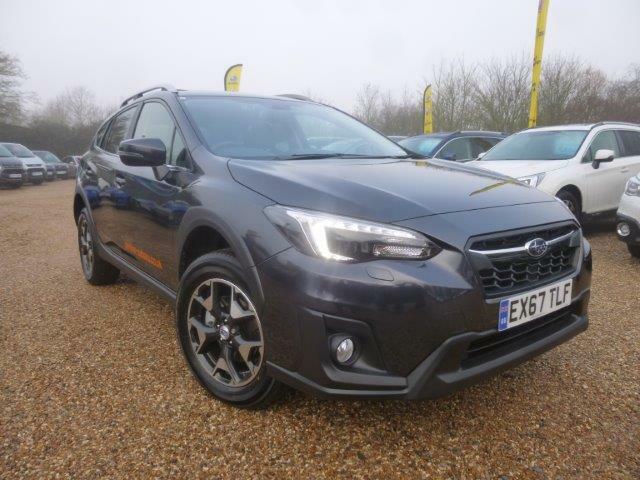 Built on the New Subaru Global Platform, this car sets the way forward for future Subaru models and gives confidence in every aspect of the driving experieince. It has been engineered with two main objectives ** SAFETY PERFORMANCE ** DYNAMIC QUALITY for Increased Straight Line Stability, Reduced Noise Vibration and Improved Handling ans Ride quality. The new Hot Press frame of the vehicle is adopted to increase material strengh by 90% over the previous platform to make the New XV the safest car in its class - Check out the Euro NCAP safety rating at https://www.euroncap.com/en/results/subaru/xv/29055 ( just copy and paste that into your browser and prepare to be rather stunned to this cars strength ). Great news today for Motability customers in 2018 . 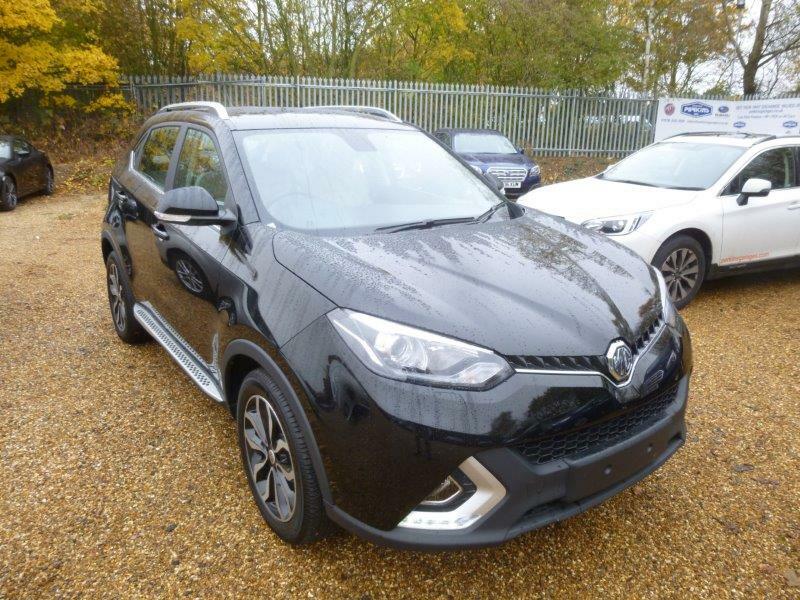 Yes, the whole range of New MG cars is now available for you to choose from and of course, the deal available is fantastic ! Here is a list of the guide prices for you to have a look at. 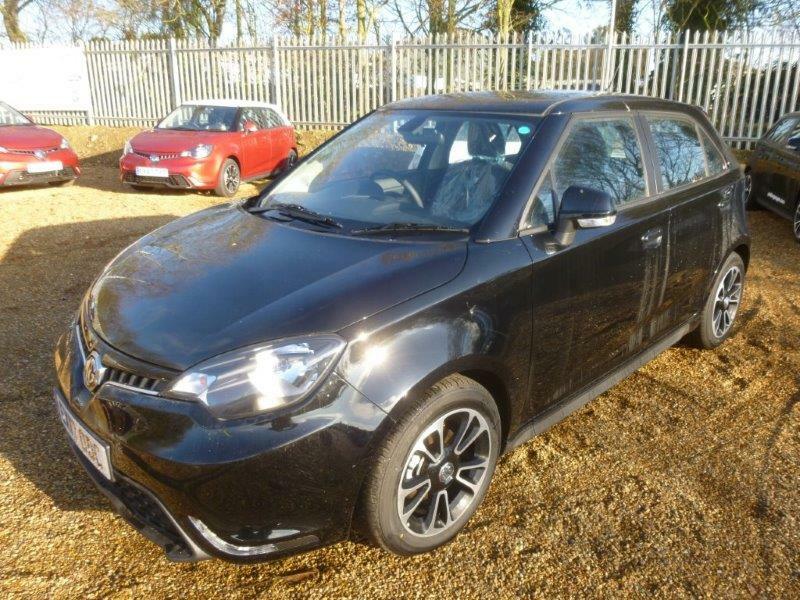 We have all models in stock and available to order and test drive here at Perkins MG Essex. 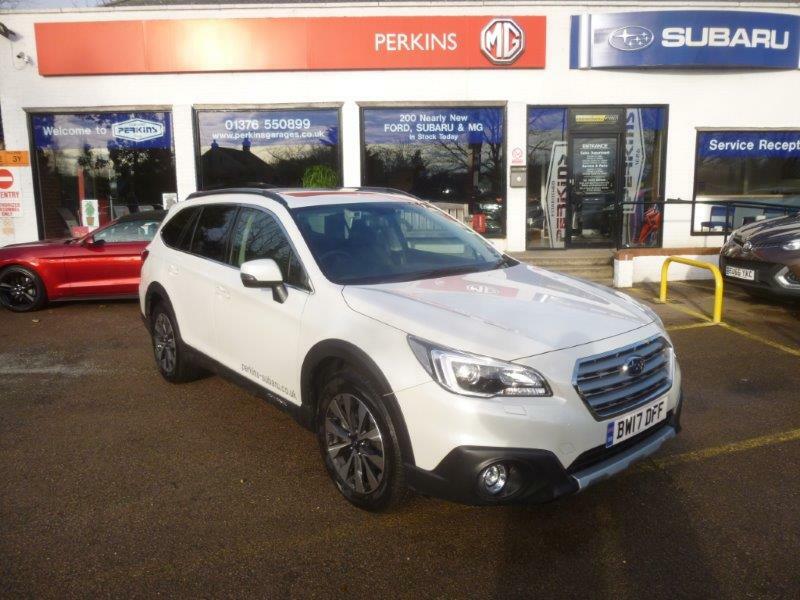 Perkins Subaru are proud to announce the arrival of two Used 2017 Subaru Outback 2.5i petrol Premium Automatic Lineartronic 170ps into our used car stock and now available for sale in Essex at your Local Subaru Dealer. Both vehicles are under 8000 miles and offer superb value at £26495 plus your road tax. 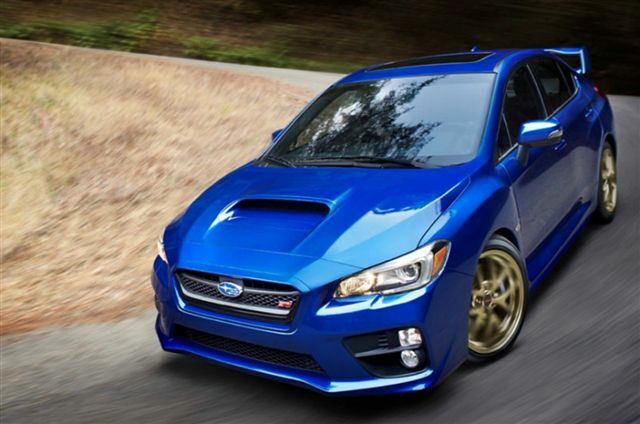 If you have not considered a Subaru in the past then perhaps you should . This amazing All Wheel Drive Estate car is just fantastic value for money in the market place filled with Audi / Volvo / Mercedes and BMW variants. The build quality is comparable and the reliability and warranty are....well , miles in front. 100 000 miles and 5 years is a very good pointer as to how reliable these cars are. Symmetrical All wheel Drive / Boxer engines to reduce vibration and increase the power delivery of the car are unique features to the brand and the specification is everything you need. Subaru's world class beating EYESIGHT anti-collision system is just about the very best in the world and the sumptuous Leather / Heated/ Power/Memory seats are like a mobile armchair. The raised seating position gives you a luxurious and magic carpet like ride whether you are cruising , A/B roads or even no roads. 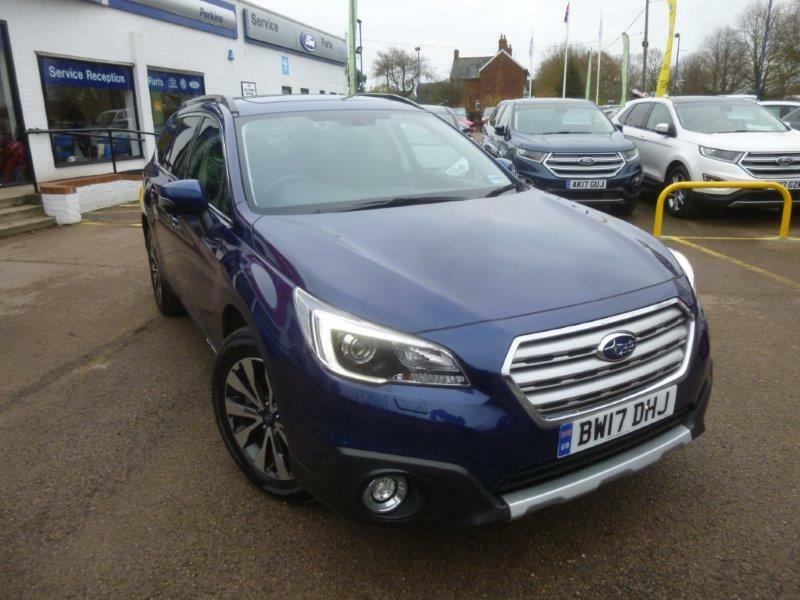 STARLINK Satellite Navigation ** Power Sunroof ** Rear Vision Camera ** X-Mode ** ESP/ABS/ISOFIX ** Adaptive cruise Control ** Dual Zone Climate Control are all standard features on the 2017 Subaru Outback. We are taking Volvo XC 70 / 90 in part exchange, Audi A4 and A6 ALLROAD and various BMW / Jaguar and Mercedes Estate cars are currently strong in part exchange value, which will help to reduce your cost to change if you have one of those marques to trade in. We also offer and excellent an LOW RATE FINANCE PACKAGE to assist your purchase. 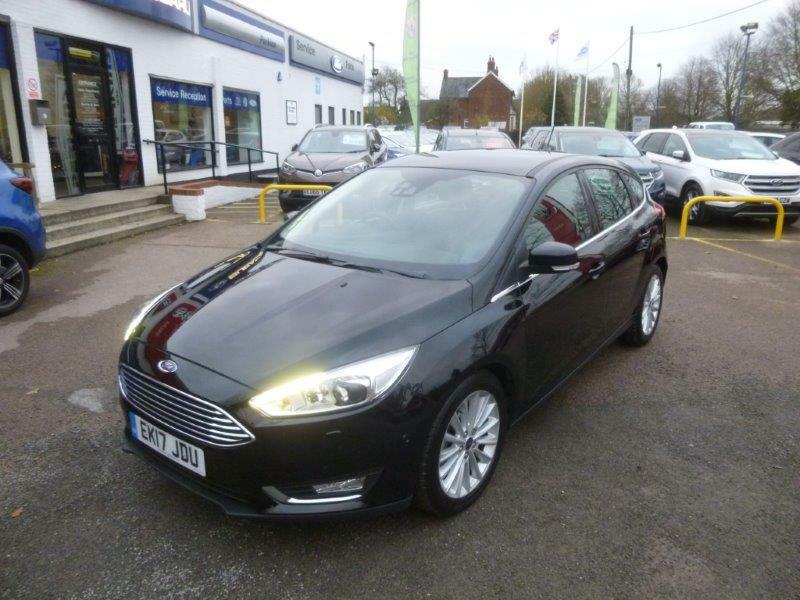 Perkins Nearly New Ford Centre are proud to offer for sale a rather rare model in the line up. AF17UKB is was registered in March 2017 and has covered only 3000 miles with one previous company owner. The car has Ford Warranty remaining until March 2020 or 60 000 miles whichever comes first and has a great specification to compliment its low mileage. 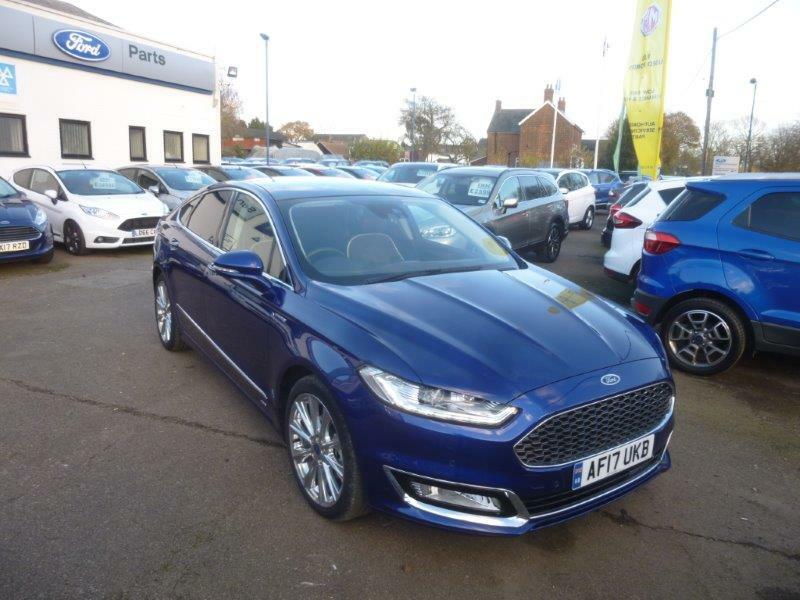 Intellegent All Wheel Drive is becoming a popular choice for drivers in the Ford marque as the AWD system constantly monitors your driving environment, optimising traction whatever the surface by directing power to where it is needed. There is a special display on the cluster panel to show the power split to keep you informed about conditions beneath each wheel. It makes the car feel "planted" when driving in veru wet conditions and of course helps your journey and increases the safety of your passengers. 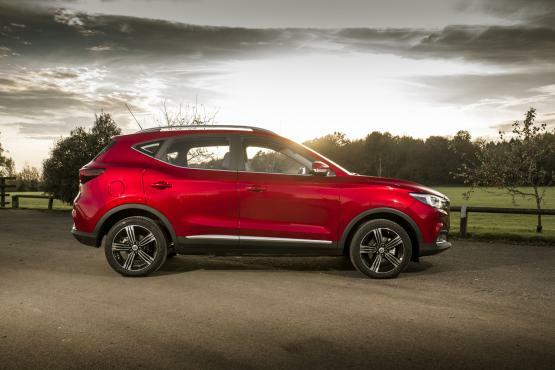 Perkins MG have new MG ZS for sale and in stock and with new models arriving daily you may be able to beat the waiting queues with by just giving us a call. They are going to be the hit of the year for 2018 so get your enquiry in soon to avoid diappointment. 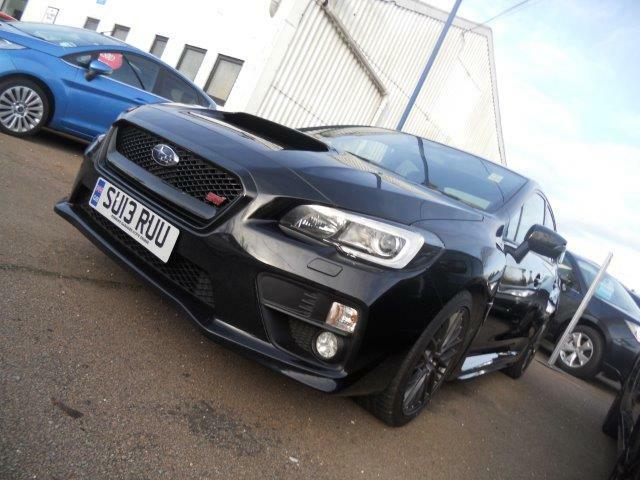 Perkins Subaru are listing 4 Used WRX Sti models for March 2018 - This Iconic motor has come to and end of production in the UK for ever so they are just about the last of the breed. You have a choice from 4 2017 cars - 2 in Dark Grey Metallic , A Crystal Black Pearl and Crstal White Pearl on 67 plates available in afew weeks also. 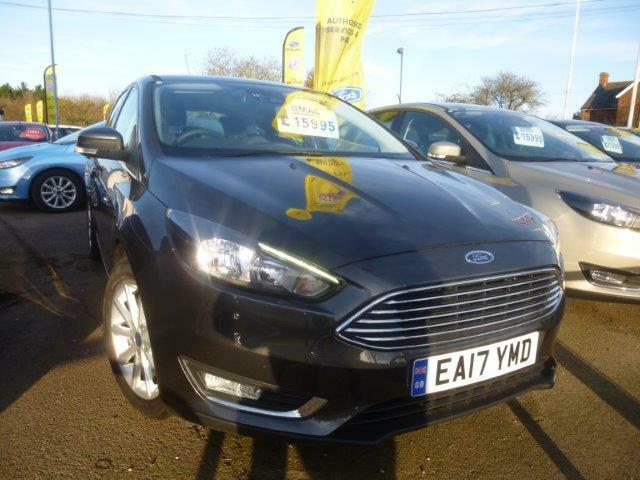 We have an excellent selection of Nearly New Ford Focus Automatic models in stock in Titanium and X Pack variants available to test drive and for sale for December 2017. 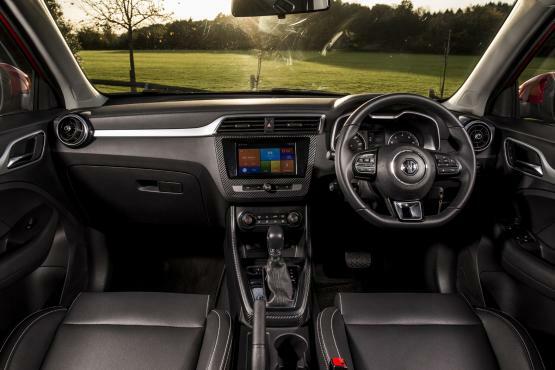 Just CALL US on 01376 55089 to make your test drive appointment.